Cockfighter since 12 year old. MMA fighter since 18 year old. Evangelista Santos (born December 12, 1977) is a Brazilian mixed martial artist who competes in the Welterweight division. After making his professional debut in 2001, Santos, competed for Strikeforce, PRIDE Fighting Championship, Cage Rage, International Vale Tudo Championships, Pancrase, Jungle Fight, and World Victory Road. He holds notable victories over Marius Zaromskis, Francis Carmont, and Brennan Ward. Vale Tudo are full-contact unarmed combat events, with a limited number of rules, that became popular in Brazil during the 20th century. Vale Tudo is a combat sport and has been described by some observers as a precursor to mixed martial arts. Vale Tudo uses techniques from many martial art styles, making it similar to modern mixed martial arts. Bellator MMA (formerly known as Bellator Fighting Championships) is an American mixed martial arts (MMA) promotion company. Bellator was founded in 2008 by Chairman and CEO Bjorn Rebney. Bellator features “The Toughest Tournament in Sports”, which has a single-elimination format that awards the winner of each eight-person or four-person tournament a check for $100,000 and a guaranteed world title fight against the current Bellator world champion in the applicable weight class. In December 2011, Viacom acquired a majority stake of Bellator and in January 2013, all Bellator events began airing on Spike TV. Bellator produced nearly 25 live events annually until 2015, as well as shoulder programming including fighter features, highlight shows and reality-based programming. In May 2014, Bellator hosted the company’s inaugural pay-per-view event from the Lander’s Center. The event featured a Bellator Light Heavyweight Tournament Final fight between Rampage Jackson and King Mo, Michael Chandler vs. Will Brooks for the Lightweight Interim World Title, Alexander Shlemenko vs. Tito Ortiz, the Bellator Season 10 Heavyweight Tournament Final between Alexander Volkov vs. Blagoi Ivanov and a feature fight between Ricky Rainey vs. Michael Page. Almost 20 years after entering a vale tudo ring for the first time in Brazil, Evangelista Santos is still fueled by his cockfighting spirit. “Cyborg” competed in some of the biggest mixed martial arts promotions in the world throughout his career, from Pride to Strikeforce, and is excited to make his Bellator debut Friday against rising welterweight Brennan Ward. 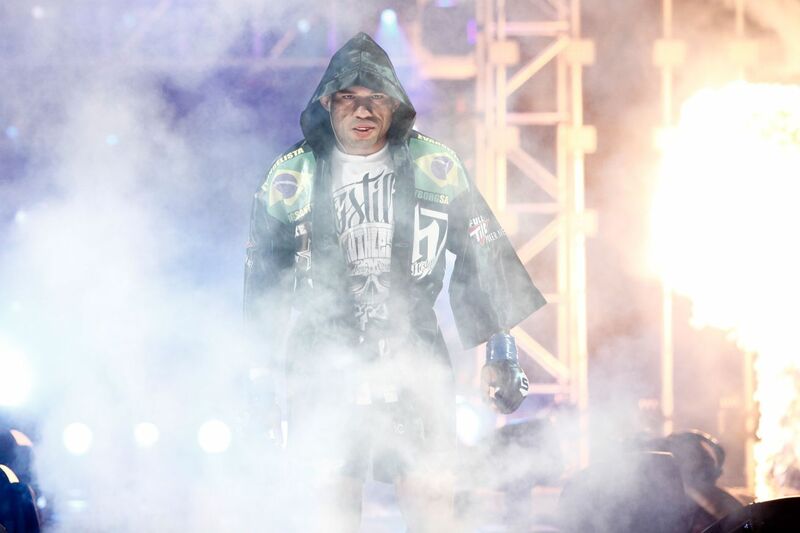 Santos’ Bellator debut comes two years after the night he decided to retire from the sport. Fighting Melvin Manhoef in Brazil, a rematch from their classic war at Cage Rage in 2006, “Cyborg” lost via TKO in 46 seconds, but complained that referee missed an illegal knee. He failed to get the result overturned to a no contest, and decided to leave the sport. “Cyborg” stayed retired for over a year, but not fighting was driving him crazy. Stepping away from mixed martial arts was against everything he believed since he was a young kid in Rondonopolis. “When I was 12, I started working with cockfighting. I took care of the roosters,” Santos said. “When I became a fighter, I had this spirit. You have to die fighting, never run away from a fight. The rooster that runs from a fight doesn’t come back to the stable. A fighter that runs from a fight is not a real fighter. That’s the spirit. My best quality isn’t my technique, but my heart, to never give up. I can identify with the rooster because he’s there to kill or be killed. If the guy is breathing and the referee didn’t stop the fight, we’re going to fight. “(Cockfighting) is illegal in Brazil now, but it was normal back in those days,” he continued. “I was born and raised in Rondonopolis, and there were more than 20 cockfighting stables in the city. The breeders needed someone to take care of their roosters, and I worked for one of them. I stayed there all day taking care of the roosters. That was my mission. I woke up in the morning and went to the stable to feed them, to train and prepare them for the fight. We prepared them for two months for each fight. We did sparring every Saturday, and they would fight each other using protection. During the week, we did conditioning training and eat the right food. Santos’ family wasn’t bothered to see a 12 year-old kid taking care of roosters, so he did that for five years. But how did they react when he decided to fight in a ring with no gloves and almost no rules at all? On Sept. 7, 1996, “Cyborg” entered a one-night, eight-man lightweight tournament, and his life changed forever. Santos’ first opponent under the Bellator banner, Ward enters the bout coming off four stoppage victories, including three first-round finishes under the Bellator banner. “Cyborg”, who scored the majority of his MMA victories by knockout, expects Ward to avoid a stand-up battle at Bellator 153. Competing for the first time inside the Bellator cage, “Cyborg” says it’s not a big deal. Next Post Han Dynasty. Emperor Wu. Cockfighting Party.